For a limited time, please schedule an appointment or walk in to receive a vision screening absolutely free! Complete pair of single vision cr-39 glasses starting at $99. Buy a complete pair of glasses at regular price, get a second pair half off. 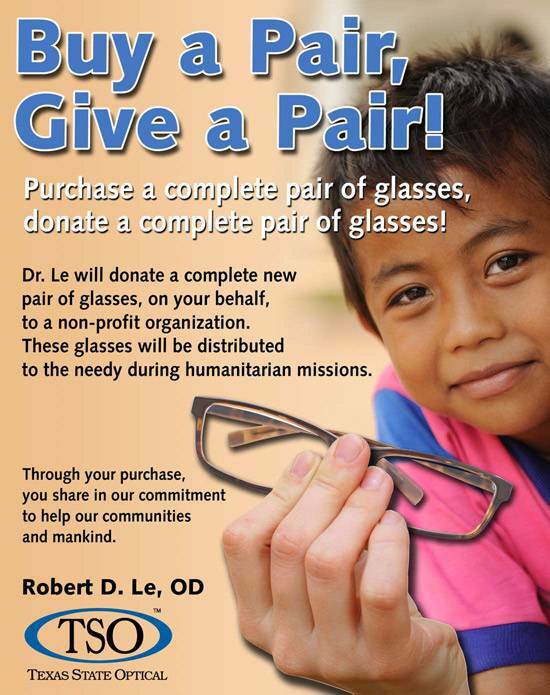 Buy a complete pair of glasses, and we will donate a complete pair of glasses to a charity. 20% off for employees of local businesses. "I've been seeing Dr. Le for the past 14 years and have had wonderful experiences with him and his staff. They have great selections and prices for frames. My daughter, also sees him and she loves it here. If, you're looking for an Optometrist that is wonderful along with his staff go see Dr. Le." "I really appreciate Dr. Le. He is very friendly, down-to-earth, and personable. The customer service is exceptional. He also knows how to move patients through the eye exam quickly and yet without losing quality." "Great personal service! Felt welcomed and cared for the entire time. I have some "unique" eyes and they took great care of me." "I have been going to Dr Le for 10years! He is awesome, answers all my questions and concerns. I recently moved to Austin and still travel in to see him. The staff there is great also, they are on top of it:)"
"They are always so friendly and willing to help!!!" "I have been going to Dr Le for over 10 years. He is, by far, the best optometrist I have ever been to. He is personable, kind and makes me laugh....oh and he helps me see things clearly 😉 If you are looking for the perfect eye doctor then you should absolutely come by Sugar Land TSO. He and his staff are wonderful people. I would recommend them hands down to anyone. Thank you Dr Le and staff!!" "Broke glasses while on vacation, called and they were happy to see us after lunch, no appointment needed. Godsend as we were at basketball camp and doing lots of stuff so seeing was important. Fixed in less than 10 minures. Thank you"
"Great Eye Doctor and Great Staff. Super fast service. My visit took around 30mins or less. Easy place to find because its right off HWY 59 in Sugar Land. I will keep coming here." "Had a really positive experience! The doctor was super helpful and smart and the lady who was helping pick out lenses was amazing! We went through tons of them but she ended up picking out a pair I fell in love with! Will definitely be back." "Dr. Lee was great with my son and myself and I couldn't ask for a better business experience especially with our eyes"
"We had a bit of an emergency. Our ten year old needed glasses since his broke and were lost while he was staying with relatives. The reviews of other offices told of pitiful turn around times. 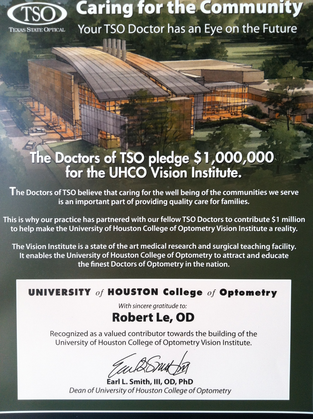 When my friend recommended Dr Robert Le and told us he cuts the lenses in-house, we were at Sugar Land TSO that same day. He did a great job fitting the frames to a child's face and was careful to help us select a set that looked great and would hold up to a young boy's daily use! We were called the next day to pick up the glasses! We were thrilled with the turn around time and the quality of service." "Dr. Le is a compassionate person and Doctor. He believes in treating everyone like family and he generously supports his local community." "Called and got an appointment the same day. Fast and great service!" "Dr Le and his staff are awesome!! He's been my optometrist for over 10 years now and I just love him!" "Dr. Le is awesome. He helped me fine tune my vision in less than 15 minutes. I picked out the glasses I wanted and he cut them in less than an hour. Unfortunately they don't take my insurance so I paid out of pocket but it's totally worth it to be able to see properly. The staff at TSO Sugar Land are amazing. Very friendly, helpful, and go the extra mile to make you happy." "Dr. Le and his staff are great! Always friendly and helpful!"